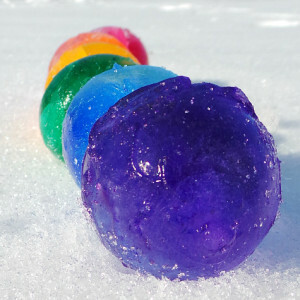 Winter is here and its time for some creative outdoor fun with some rainbow ice orbs! This affordable, fun and easy craft is perfect for the kids on a snow day, for holiday parties, or just to add a little extra décor to the outside of you home! Kids will love experimenting and being creative with this simple project. It’s all about their imagination! 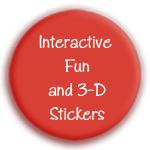 Kids will love experimenting and being creative with this simple project. It’s all about their imagination! Take your balloons and put a few drops of food coloring or Kool-aid powder into a balloon, then fill with water. Experiment with the amount of drops to create different color shades. Food coloring makes more of a marbled look, while Kool-aid makes a solid color. Place outside, if it’s cold enough, or in the freezer over night. Depending on how big the balloons are and how cold it is, this will take about 24 hours. Hold them up to the light to see if they are frozen all the way through. Adults cut off the balloons and reveal the rainbow orbs! Have fun and get creative! You are only limited by your imagination here. Let the kids take the lead, and be there to offer a helping hand if need be. But, make sure an adult is the one to cut the balloon away from the ice. Once the orbs are done you can line them up in patterns, maybe a Christmas tree shape on the lawn?! You can stack them or line them along your entryway path. Let the kids decide! What a fun way to bring some color into the white of winter! Have fun and happy creating. Share your orb creations with us on our Facebook page!